Generally speaking currents are a horizontal movement of water. Ocean currents may be classified as tidal and nontidal. Nontidal currents include the permanent currents in the general circulatory systems of the sea as well as temporary currents arising from more pronounced meteorological variability. The Major global Nontidal currents. From Wiki commons. Coastal currents are intricately tied to winds, waves, and land formations. Winds that blow along the shoreline, longshore winds,affect waves and, therefore, currents. As a wave moves toward the beach, different segments of the wave encounter the beach before others, which slows these segments down. As a result, the wave tends to bend and conform to the general shape of the coastline. Waves do not typically reach the beach perfectly parallel to the shoreline, rather, they arrive at a slight angle. When a wave reaches a beach or coastline, it releases a burst of energy that generates a current, which runs parallel to the shoreline. This type of current is called a "longshore current". 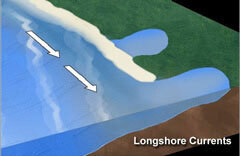 Longshore currents are affected by the velocity and angle of a wave. When a wave breaks at a more acute (steep) angle on a beach, encounters a steeper beach slope, or is very high, longshore currents increase in velocity. Conversely, a wider breaking angle, gentler beach slope, and lower wave height slows a longshore current’s velocity. In either case, the water in a longshore current flows up onto the beach, and back into the ocean, as it moves in a “sheet” formation. As this sheet of water moves on and off the beach, it can “capture” and transport beach sediment back out to sea. This process, known as “longshore drift,” can cause significant beach erosion. Rip currents extending from the beach. From NOAA. When waves travel from deep to shallow water, they break near the shoreline and generate currents. A rip current forms when a narrow, fast-moving section of water travels in an offshore direction. As longshore currents move on and off the beach, "rip currents" may form around low spots or breaks in sandbars, and also near structures such as jetties and piers. A rip current is a localized current that flows away from the shoreline toward the ocean, perpendicular or at an acute angle to the shoreline. It usually breaks up not far from shore and is generally not more than 25 meters wide. If wave activity is slight, several low rip currents can form, in various sizes and velocities. But in heavier wave action, fewer, more concentrated rip currents can form. As the name suggests boundary currents flow along the boundaries of ocean basins. Western boundary currents, are narrow, deep-reaching, and fast-flowing currents, associated with current instability and eddy shedding. The East Australia current (EAC) is a Western Boundary current that flows southward along the east coast of Australia. The EAC is often measured off Stradbroke Island in Queensland by a new type of waverider buoy capable of measuring currents as well as waves. Eastern boundary currents are shallow and cover a wider region and are of moderate strength. they are often associated with coastal upwelling and a subsurface counter-current along the continental slope. Trade winds that prevail over the tropical oceans drive complex oceanic circulations, these are characterized by alternating eastward and westward currents. that are confined to the surface layers of the ocean. The Antarctic circum polar current is the only current that flows completely around the globe, it is also the strongest of all ocean currents. Tides create a current in the oceans, near the shore, and in bays and estuaries along the coast. These are called "tidal currents." Tidal currents are the only type of currents that change in a very regular pattern and can be predicted for future dates. Tidal currents are caused by gravitational attraction of the Moon (the lunar tide) and the Sun (the solar tide) and the gravitational force of the Earth. 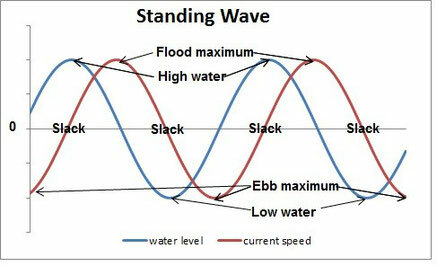 Tidal currents are the alternating horizontal movement of water associated with the rise and fall of the tide. When the tide is rising and the flow of the current is directed towards the shore, the tidal current is called the flood (tide) current, and when the tide is receding, it is called the ebb (tide) current. In the deep open ocean maximum tidal currents tend to parallel high water and low water, with slack water occurring somewhere between high and low tides. Slack water occurs at times of little or no water movement. This wave form is called a progressive wave. Tidal currents in coastal regions. Copyright Marine Science of Australia, all rights reserved. 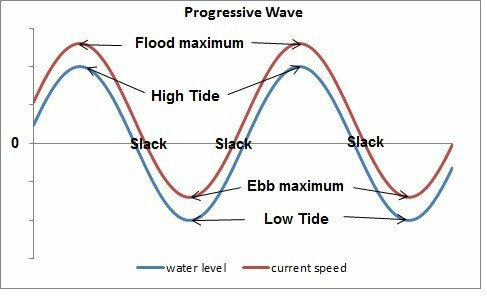 When the tide wave enters shallow coastal waters, friction with the bottom slows the current, and the maximum current speed is then delayed to be mid way between low and high waters.